Happy Wednesday!! Today we have Sarah sharing some very cute baby gift ideas! This post was supposed to go live last week but because I was crazy busy I completely forgot and I feel so bad about that so would you all please go over to Sarah's wonderful blog and show some love! I really don't have to convince you! After you read her post you will want to see more of her creations! Hello! I am Sarah from 16 Bourne | sarah reagan auer blog. I am pretty new to the blogging scene, so thank you so much for your support! I am having so much fun meeting new people (albeit virtually) and love seeing so many awesome ideas and all of the sharing. I am thrilled to be a guest blogger on Cinsarah- one of the nicest most helpful bloggers I have met. Big shout out to her for helping me with the design of my blog too! 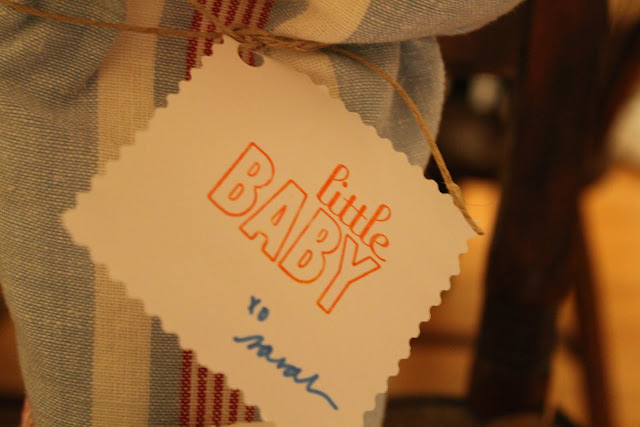 I am going to share some fun ideas for a handmade baby shower gifts. 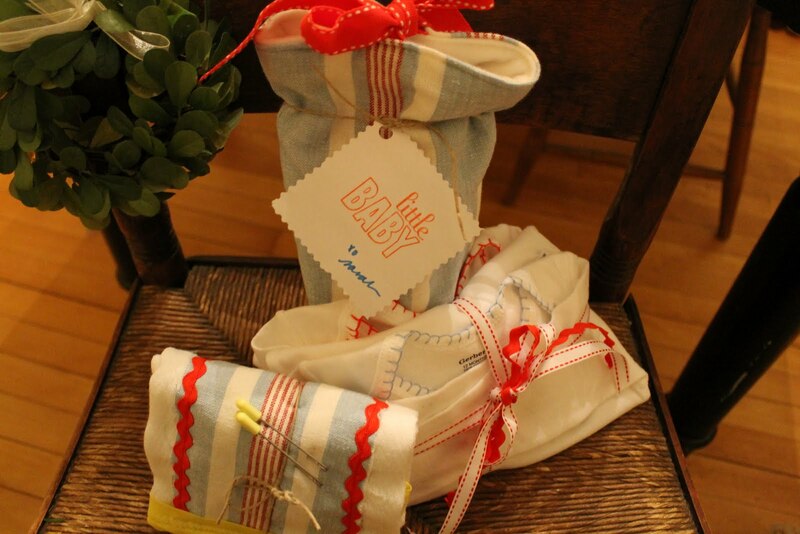 It is a three parts, including hand stitched Onsies, burp cloth and bottle pouch. I decided to do a free hand heart on the sleeve of the red Onesie. I thought it would be a cute detail. You could do any shape. I have had a request for green, with a shamrock. The options are endless. I think a yellow stitch with a ducky would be cute too. Burp cloth: These are really fun, and you can do several different kinds. I often do these with just the rickrack on the going down the middle sides, and the quilt border on the ends. I decided to add the same fabric as the bottle pouch (as you will see). The base of the burp cloth is actually cloth diapers. I got the Gerber ones at Target as well, and usually come in a pack of 10. Just cut the fabric any width you would like, and pin it down, and sew along the sides. Once that is secure, pin down the rickrack on top of the stitching, and sew the rickrack on top. Once complete, cut the ends so they are not overhanging the ends. Add the quilt border (I used yellow) to the ends of the burp cloth- pin, and sew on. I used the zigzag stitch on my sewing machine just because I like the look. The last piece I did was the bottle pouch. You will need: 1/2 yard fabric (anything you want for the outside), 1/2 yard polar fleece, 18 in. 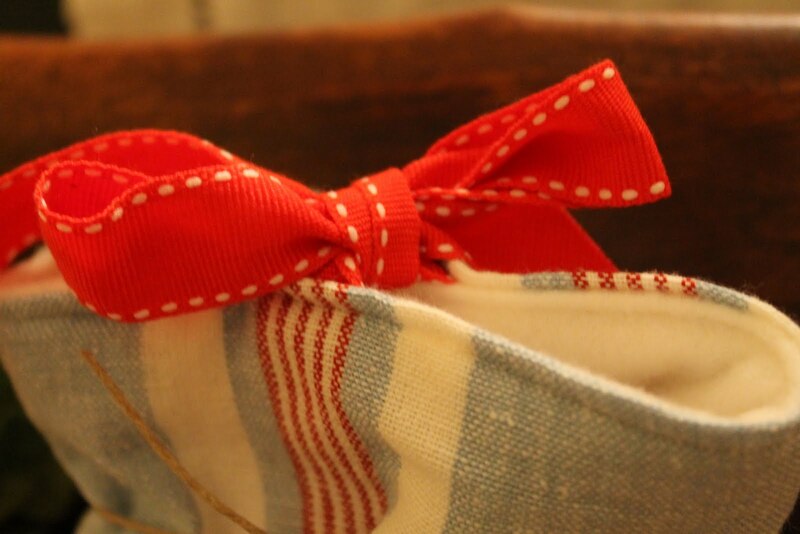 ribbon to match cloth, thread, pins, iron and sewing machine. Cut a 9" x 15 " rectangle of both fleece and fabric (you can make shorter since I know a lot of moms use the small/short bottles now). With right sides together, fold the cloth in half lengthwise and pin the edges together. Sew along the long side, leaving a 1/2 inch seam allowance. Do the same thing with the fleece. Slide the fabric into the fleece tube. Make sure the bottom edges are flush- pin, then sew together (to be making the bottom of the pouch). Turn right side out, and press. Now cut the matching ribbon in half, and pin each piece on to the fleece, across from each other at the top of the pouch. Fold in the fleece, and cloth toward each other and pin (this makes it so you can't see the ragged edges of the top). 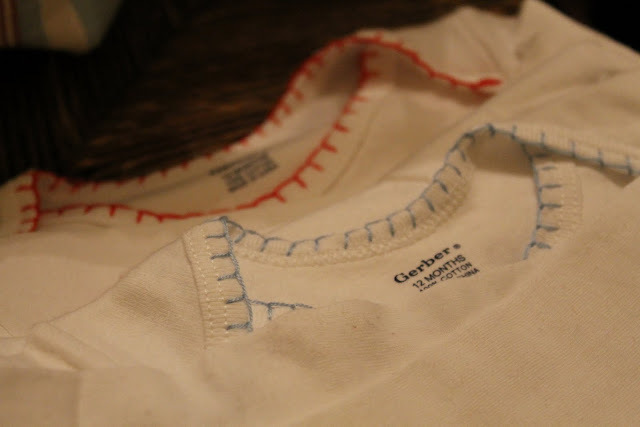 Carefully pin an sew with a running stitch. When you do this, you will be sewing the ribbon into place. Press the entire pouch and add bottle, then tie ribbon together to make a bow. (I have to credit the book Everything for Baby by Adelaide d'Andigne for this idea). After I added the bottle, I tied some twine around with a little tag I made using white paper, stamp and rickrack scissors. Here are all items together. You could put them all in a little white basket with red tissue paper, tie a bow with matching ribbon when gift giving. I hope you enjoyed these ideas. Of course, you do not need to do them all together. Please check out my blog, 16 Bourne | sarah reagan auer for more ideas, and thanks very much Cindy for having me! Such a great idea to spruce up a simple gift. I love it! Oh my, this is the sweetest little gift! How adorable! Great choice in fabric & colors! It seems like im going to a baby shower every week, and those are some great gift ideas that i will try for sure.